OSMF was well established in the Indian medical literature since the time of Sushruta, a renowned physician who lived in the era 600 BC, and was termed as “Vidari.” It was first described in the modern literature by Schwartz, in 1952, who coined the term “atrophia idiopathica mucosa oris” to describe an oral fibrosing disease, he discovered in five Indian women from Kenya. Joshi subsequently coined the term “oral submucous fibrosis (OSMF)” for the condition in 1953. Epidemiological studies show unique prevalence of this premalignant condition in India and Southeast Asia. The malignant transformation rate for OSMF is 7%–30%. A wide range of treatment modalities, both medical and surgical, has been proposed but none have been proved, hence search of an effective treatment modality still continues. Plants have a major source of medicinal use. Turmeric has been attributed a number of medicinal properties. Turmeric and its active ingredient, “curcumin,” are being studied as chemopreventive agents in India and abroad. Curcumin and its oil have been found to inhibit many disease processes through their anti-inflammatory, antioxidant, and anticancer properties. This study is proposed to evaluate the efficacy of various forms of curcumin in patients with OSMF and to compare it with conventional treatments such as multivitamin and antioxidant tablets. This study was conducted in the Department of Oral Medicine and Radiology, College of Dental Science and Research Center, Ahmedabad, Gujarat, India, for 8 weeks. A total of 120 patients who were clinically and histopathologically confirmed as having OSMF were selected for the study. Patients clinically having OSMF were selected based on the clinical criteria given by Li et al. (1995), and they were classified on the basis of inter-incisal distance as Group A, B, C, and D. These patients were randomly divided into four groups consisting of 30 patients in each group. Tablets, capsules, and oil were manufactured for the treatment purpose and given to the patients randomly divided into four groups. Group I patients were given tablets, Group II were given capsules, Group III were given oil, and Group IV was control group. Along with this treatment, all patients were also given general instructions to quit habit, consume green leafy vegetables, avoid spicy food, and perform mouth-opening exercise with ice cream sticks. A packet containing 45 tablets each of curcumin (350mg) was given to the patients in Group I and they were instructed to take tablets thrice daily for 15 days. A packet containing 30 capsules each of curcumin (500mg) was given to the patients in Group II and they were instructed to take capsules twice daily for 15 days. Oil of curcumin (10mL) was given to Group III patients and they were instructed to apply topically for 15min twice daily and avoid eating and drinking for half an hour after application. A packet containing 30 Multinal tablets (500mg) each was given to the patients in Group IV and they were instructed to take these tablets twice daily for 15 days. The patients were instructed to report every 15 days during the follow-up of 15, 30, 45, and 60 days, and the difference was noted in the severity of burning sensation, mouth opening, tongue protrusion, and cheek flexibility in all four groups from the beginning till the end of the treatment, and then the results were evaluated using analysis of variance test. All the patients in the study tolerated the treatment regimens well. None of the patients reported any allergy or abnormal reaction or any symptoms of toxicity to the treatment modality. 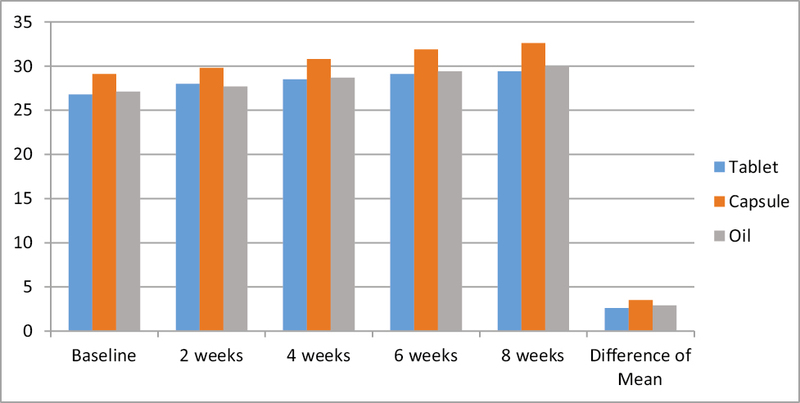 When we compared the mean of tongue protrusion of patients of all groups at the beginning and at the end of 8 weeks, we found significant improvement in patients who took curcumin compared to that in control group. The mean difference obtained of capsule and oil was 0.3 and of tablet was 0.2, which is significant as compared to that of control group, which was 0.1 [Table 1]. A significant improvement in the burning sensation of the patient was reported when treated with curcumin. The patients in Group IV showed minimal improvement when compared to those in the other three groups, whereas better results with burning sensation was observed in Group III patients [Figure 1]. A statistically significant increase in the mouth opening of patients was observed in Group I, II, and III as compared to that in Group IV after a follow-up of 8 weeks. The mean increase was 2.6, 3.5, and 2.9 in Group I, II, and III, respectively, compared to that in Group IV, which was 0.8. 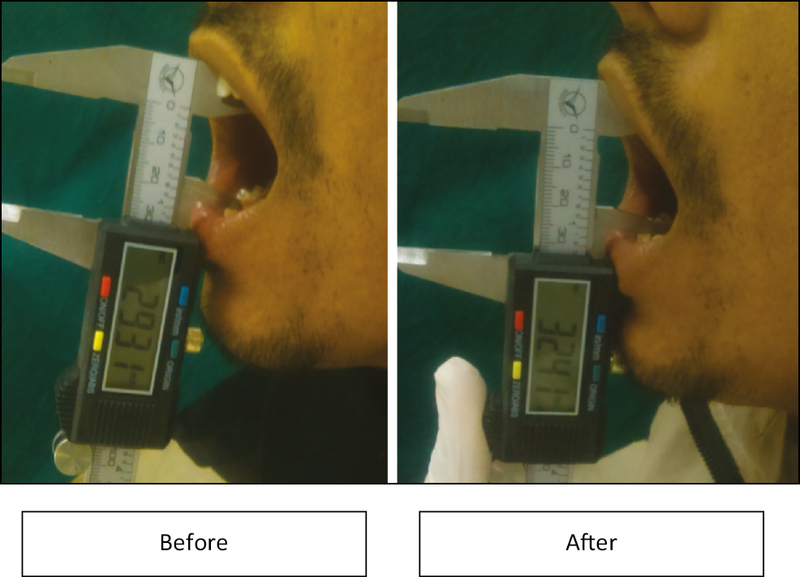 The patients treated by capsules showed best result in mouth opening [Figure 2]. The clinical scores of OSMF in patients of the four groups were noted before the treatment and at every visit during the treatment and follow-up. A remarkable reduction in the clinical scoring of the patients of Group I, II, and III was observed after first 15 days of the treatment. After 8 weeks of treatment, the patients in Group I, II, and III showed classic improvement compared to that in Group IV for tongue protrusion, burning sensation, and mouth opening [Figure 3]. Oil showed better results in the reduction of burning sensation, whereas capsules showed good improvement in the score of mouth opening and tongue protrusion. Therefore, it can be stated that turmeric in all forms is a better treatment modality in improving signs and symptoms of OSMF. The increase in mouth opening and tongue protrusion brought about by the treatment could be a result of the anti-inflammatory, antioxidant, and fibrinolytic properties of curcumin and turmeric oil. Zhang et al. performed a study on antifibrotic effect of curcumin and concluded that type I and III collagens are the main components of extracellular matrix (ECM). A reduction in the deposition of ECM is of great importance in the treatment of OSMF. By inhibiting the proliferation and inducing apoptosis of myofibroblasts, curcumin effectively decreases the generation of type I and III collagens, confirming its potential therapeutic value in OSMF. Kumar et al. conducted a study on the pathological observations of curcumin in animal model and concluded that it shows profound antitumorigenic and antimutagenic activity. Turmeric has been described as a dual inhibitor of arachidonic acid metabolism as it inhibits both cylooxygenase and lipoxygenase pathways of inflammation, thus inhibiting the products of inflammation such as prostaglandins and leukotrienes. Impairment of reactive oxygen species (ROS) by curcumin has been proved, which occurs through its interaction with thioredoxin reductase, thus altering its activity to nicotinamide adenine dinucleotide phosphate oxidase, which could lead to production of ROS. It is known to scavenge superoxide anion radicals and hydroxyl radicals generated by activated macrophages, which play an important role in inflammation. The antioxidant activity of curcumin could be mediated through antioxidant enzymes such as superoxide dismutase, catalases, and glutathione peroxidase. A study by Rai et al. on possible action mechanism for curcumin in precancerous lesions based on serum and salivary markers of oxidative stress concluded that curcumin significantly increases the local and systemic antioxidant status and the levels of vitamins C and E and decreases lipid peroxidation and DNA damage of patients. So the effects brought about by the treatment regimen using curcumin oil and systemic curcumin could be a synergism of their anti-inflammatory and antioxidant properties. A statistically significant improvement was observed in the clinical signs and symptoms of the patients treated with systemic curcumin and curcumin oil when compared to those treated with multivitamin tablets after treatment and follow-up evaluation. Those treated with multivitamin tablets hardly showed any improvement in the signs and symptoms. It can be concluded that turmeric is a safe, nontoxic, and an effective alternative for many conventional drugs because of its distinguished therapeutic properties and multiple effects on various systems of the body. Its role in the treatment of oral potentially malignant disorders and oral cancer is very promising. However, not enough information and research is available in this field, and therefore continuous further research is required to determine the efficacy of curcumin and its application in wide range of oral diseases. Samdariya S, Kumar D, Kumar A, Porwal P, Pareek P. Oral submucous fibrosis—A short review. IJMSPH 2014;3:1308-12. Hebbar PB, Sheshaprasad R, Gurudath S, Pai A, Sujatha D. Oral submucous fibrosis in India: Are we progressing?? Indian J Cancer 2014;51:222-6. Chopra A, Sethi PS, Singh J, Dimple. Oral submucous fibrosis (OSMF). Indian J Dermatol Venereol Leprol 2000;66:255-6. Raghunath T, Maheshwaran T, Dineshshankar J, Anusushanth A, Sindhuja P, Sitra G. Pathogenesis and therapeutic intervention of oral submucous fibrosis. J Pharm Bioallied Sci 2013;25:S85-8. Lawande S. Therapeutic applications of turmeric (Curcumin longa) in a dentistry: A promising future. J Pharm Biomed Sci 2013;27:586-91. More CB, Gupta S, Joshi J. Classification system for Oral Submucous Fibrosis. Journal of Indian Academy of Oral Medicine and Radiology 2012;24:24-9. Zhang SS, Gong ZJ, Li WH, Wang X, Ling TY. Antifibrotic effect of curcumin in TGF-β 1-induced myofibroblasts from human oral mucosa. Asian Pac J Cancer Prev 2012;13:289-94. Kumar NS, Vijaybhasker D, Purushotham Rao K, Pratima S. Pathological observations on the treatment of oral submucous fibrosis of curcumin gels in animal models. Der Pharmacia Lettre 2012;4:919-26. Namratha K, Shenai P, Chatra L, Kumar Rao P, Veena KM, Prabhu RV. Antioxidant and anticancer effects of curcumin—A review. J Contemp Med 2013;3:136-43. Nagpal M, Sood S. Role of curcumin in systemic and oral health: An overview. J Nat Sci Biol Med 2013;4:3-7. Michalak M, Paulo M, Pudlo K. Therapeutic significance of curcumin and its role in cancer treatment. J Pre Clin Clin Res 2012;6:73-6. Mathur V, Tijare M, Desai A, Gupta S, Kallianpur S. Curcumin—Oral cure from the Indian curry. Inter J Pharmacotherapy 2014;4:137-40. Swathi R. Oral submucous fibrosis and the role of curcumin in its treatment: A review. Int J Pharm Sci Intervention 2015;4:7-10. Rai B, Kaur J, Jacobs R, Singh J. Possible action mechanism for curcumin in pre-cancerous lesions based on serum and salivary markers of oxidative stress. J Oral Sci 2010;52:251-6.